From 10 April 1806, her married name became Hope. After her marriage, Hon. Louisa Beresford was styled as Viscountess Beresford of Beresford on 29 November 1832. From 29 November 1832, her married name became Beresford. [S6] G.E. Cokayne; with Vicary Gibbs, H.A. Doubleday, Geoffrey H. White, Duncan Warrand and Lord Howard de Walden, editors, The Complete Peerage of England, Scotland, Ireland, Great Britain and the United Kingdom, Extant, Extinct or Dormant, new ed., 13 volumes in 14 (1910-1959; reprint in 6 volumes, Gloucester, U.K.: Alan Sutton Publishing, 2000), volume II, page 118. Hereinafter cited as The Complete Peerage. Thomas Hope was born in 1769.2 He married Hon. Louisa Beresford, daughter of William Beresford, 1st Baron Decies and Elizabeth FitzGibbon, on 10 April 1806.1 He died on 2 February 1831. [S6] G.E. Cokayne; with Vicary Gibbs, H.A. Doubleday, Geoffrey H. White, Duncan Warrand and Lord Howard de Walden, editors, The Complete Peerage of England, Scotland, Ireland, Great Britain and the United Kingdom, Extant, Extinct or Dormant, new ed., 13 volumes in 14 (1910-1959; reprint in 6 volumes, Gloucester, U.K.: Alan Sutton Publishing, 2000), volume II, page 116. Hereinafter cited as The Complete Peerage. [S6] Cokayne, and others, The Complete Peerage, volume II, page 118. [S6] Cokayne, and others, The Complete Peerage, volume II, page 117. [S18] Matthew H.C.G., editor, Dictionary of National Biography on CD-ROM (Oxford, U.K.: Oxford University Press, 1995), reference: "Beresford, William Carr". Hereinafter cited as Dictionary of National Biography. 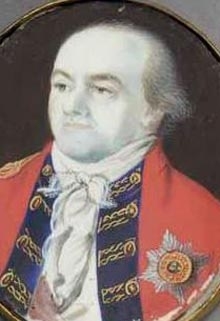 Sir John Pollard Willoughby, 4th Bt. gained the title of 4th Baronet Willoughby. Children of Sir John Pollard Willoughby, 4th Bt. From 31 July 1860, her married name became Horsley-Beresford.1 After her marriage, Catherine Anne Dent was styled as Baroness Decies on 1 March 1865.